Arsenal drew at Barnet in their traditional pre-season friendly at the Underhill. 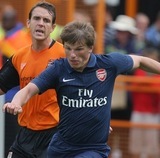 Tomas Roskicky captained the Arsenal, a fine sight for Gooners who haven’t seen Rosicky in action for many months, while new signing Tomas Vermaelen made his debut. gr8 game nice to see them jelled together so quickly..